26 Cruzatte Place St Charles, MO. 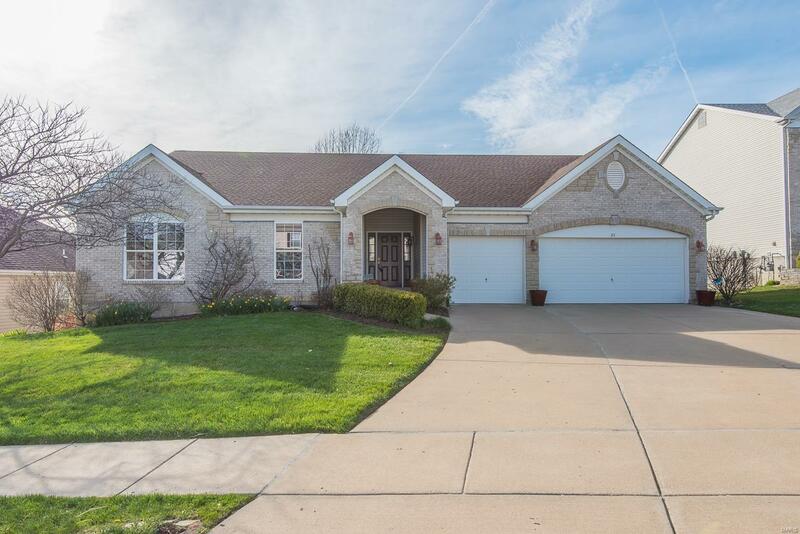 | MLS# 18028382 | Real Estate in Saint Charles and Saint Louis Areas, including Saint Charles, Saint Peters, Weldon Spring, O' Fallon, Wentzville, Dardenne Prairie, Creve Coeur, Chesterfield, Florissant, Hazelwood, Kirkwood, Des Peres, Saint Louis City, Homes for sale. Back on Market through no fault of seller. Super neat and clean 4 bedroom 2 bathroom atrium ranch BACKING TO TREES AND WOODS. There is not a neighbor immediately behind this home and it backs to wooded common ground. Spacious 3 car garage and exterior brick and stone accents. Vaulted ceilings in the great room with gas fireplace. Great views out the rear atrium wall of windows. Dining room area. Open kitchen area with center island, tons and tons of cabinets, breakfast room and hearth room walking out to composite deck space. Main floor laundry. Master bedroom suite with walk in closet, and luxury master bathroom with double basin sink, separate tub and shower and upgraded fixtures. The 3 additional spacious bedrooms have walk in closets! Neat and clean hall bathroom. This home has 2662 sqft on the main floor and the lower level atrium is awaiting your finish design. What an opportunity. Walkout lower level to patio space and views of wooded area. 1 year home warranty.